When it comes to the feeling preference in Myers-Briggs theory, there tends to be a lot of confusion and “side-taking” in the community. I see Fi-users put down Fe-users as “fake” and I see Fe-users put down Fi-users as “selfish”. It all gets a little bit tiring, and frustrating for individuals who feel misunderstood in the community for simply being who they are. 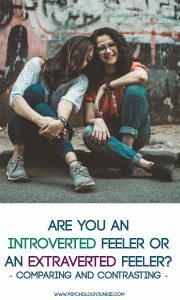 Are You An Introverted or Extraverted Feeler? – Both feeling types are concerned with morals and values. – Both feeling types want harmony in their environment. – Both feeling types dislike conflict. – Both feeling types tend to dislike handing out criticism and tend to take criticism personally. – Both feeling types (if healthy) are empathetic. – Both feeling types consider the human implications of their decisions. – Both feeling types try to “step into” a situation when making a decision to see how it will impact the people involved. The major difference between introverted feeling and extraverted feeling lies in where one focuses their attention and gathers their emotional input more. Introverted feelers (or Fi-users for short) look inside themselves to gain a sense of identity, values, independent morals, and ethics. Fe-users look outside themselves to understand their values, morals, and the emotions and ethics of others. When making a decision, a Fi-user will ask themselves “How does this align with my values? Do I feel right about this? What does my gut instinct tell me? Is this what I want?”. Introverted feeling is subjective so it looks at the subject (him or herself) first when deciding. Carl Jung said of introverted feeling that it is “intensive rather than extensive”. When a Fe-user makes a decision they will ask themselves “How will this impact others? Will this maintain harmony? Is this right? How will this make people feel?”. Extraverted feeling is objective so it looks at the world outside when it decides. Does this mean that Fi-users don’t care about how other people are impacted? Does this mean that that Fe-users never look inside themselves and to their own values? Absolutely not. But generally, Fi-users will look inside first, and Fe-users will look outside first. This is why Fe-users tend to think out their decisions and “talk them out” with other people. They are trying to discern whether or not their decisions are agreeable, sensible to others, and impact others in a positive way. Both Te (extraverted thinking) and Fe users tend to “talk out” or extravert their decision-making. Fi-users are less in need of assurance from others for their decisions, and care less whether or not their decisions are objective because their subjective values take precedence over objective values. They have an inner serenity and resolve regarding their values and feel that everyone has the right and responsibility to their own independent values and feelings. They make their decisions in an internal way and are less likely to “talk out” decisions with others. Now Extraverted Feeling types (Fe-users) may really be inspired by Watterson’s quotes (I know I am). Because they speak of values the Fe-user is naturally interested as a feeling type. However, Fe-users are more likely to look outside and consider “what do other people need from me? what are the expectations people have for me? do my internal values and desires coincide with the needs of others? What if my values make no sense at all!”. The Fe-user tends to look outside, at books, trusted authorities, and friendships to understand value systems and see which ones they identify with and seem trustworthy. They may put their internal identity and desires on hold in an effort to meet the expectations of others. They are more likely to distrust their own needs and values and be more skeptical of them. The mom who leads with Fe can bury herself in her children’s needs, forever forgetting her own individual desires. A Fi-user is capable of doing the same thing if they feel a calling to selflessly serve their children, but generally they will do this out of a conviction or personal value, whereas the Fe-user will do this because they just naturally think outside first, and may forget to even look inside to consider what their own needs or desires are (like maybe they’d actually really like to be an artist, but they haven’t stopped to consider it). You can see in that last quote by von Goethe, that he believed outward influence shaped the character and behavior of a person. Manners, culture, and courtesy were all values that von Goethe spoke of frequently. While Fi-users also tend to value kindness and may value good manners, they are more likely to crave authentic expression and adherence to one’s own individual story than to follow a pre-established “code” about how one should behave. Your background, upbringing, environment, and even the placement of your feeling preference will change how you display and experience it. No two Fi-users are alike and no two Fe-users are alike. How an ENFJ expresses Fe is going to be very different from how an ISFJ expresses Fe. How an INFP experiences Fi is going to be very different from how an ESFP expresses Fi. The values of one feeling type might be far different from the values of another feeling type. So as always we need to be careful not to put all Fe-users or Fi-users in a “box” and assume they all do the same things. I find that Fi dom is easily hurtful without realising it. Fe knows when he say something hurtful. Fe try to fix quickly because they are aware of their mistake. I am INFJ with 98% on the I and 60/40 split on the J. I wasn’t born to use Fe. I am primarily suited to use Fi. Depending on where you read on the net I should be institutionalized. I had a really rough time growing up getting along with my peers. My few friends commented that I was too old for my age but they liked me anyway. When I went to college and saw old patterns repeating I made a intellectual effort to observe my new peers and try to act more like them. I developed Fe. I have spent the majority of my adult life trying to be socially normal and now that I am old, I see less need. Most of my core values are of benefit to society at large. Where society and I differ I switch back and forth with ease as it suits the situation. But at my core, I am infj with Fi.